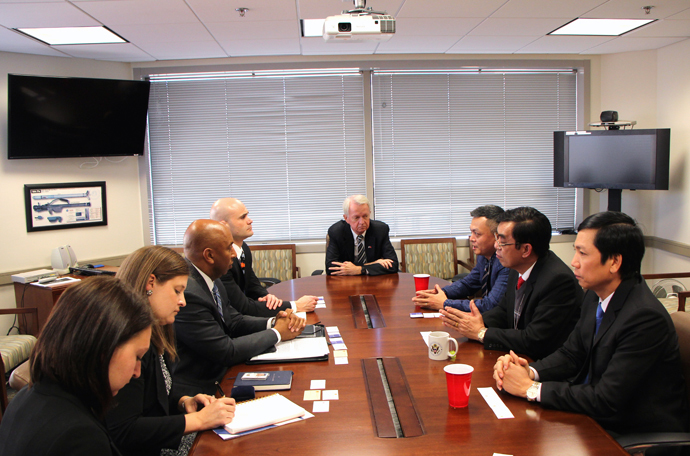 Washington, DC, USA (31 October 2017) – A delegation from Quang Tri Province led by Governor Nguyen Duc Chinh has had working meetings in Washington, DC with officials of the US Department of State and US Senate staff about US-funded mine action programs in Quang Tri Province. The discussions led to general agreement that cooperation between Quang Tri Province and the US has been successful, and should be continued or expanded. Funding from the US Department of State since 2015 for Quang Tri Province has resulted in a significant reduction in accidents, injuries, and deaths caused by unexploded ordnance. During that period, Project RENEW teams have destroyed more than 44,000 munitions left over from the war. Attending the meeting with Gov. Chinh were Mr. Hoang Nam, Director of Quang Tri Province Department of Foreign Affairs, Deputy Head of Project RENEW Steering Board, and representatives of RENEW including Coordination Manager Nguyen Hieu Trung, Communications and Development Manager Ngo Xuan Hien, and International Advisor Chuck Searcy. Quang Tri delegates meet with WRA Director Stanley Brown, Deputy Director Gerald Guilbert and Southeast Asia and Pacific Program Manager Emma Atkinson at WRA Office. Washington DC. 31 October 2017. Photo: Project RENEW. The Office of Weapons Removal and Abatement (WRA) manages US State Department programs to neutralize the threat of wartime munitions. 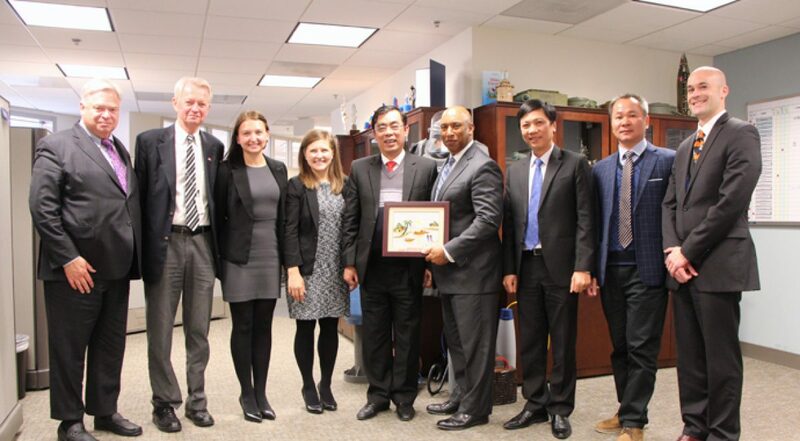 WRA Director Stanley Brown, along with Deputy Director Gerald Guilbert and Southeast Asia and Pacific Program Manager Emma Atkinson, hosted the Vietnamese delegation. 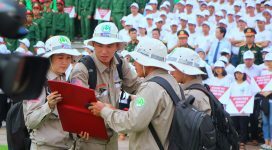 They noted that progress remains on target to make Quang Tri Province safe from the danger of bombs and mines, in accordance with a mutual goal to fully manage and safely control the problem by the year 2025. Gov. 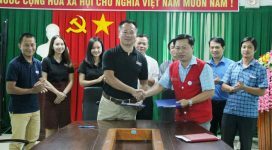 Chinh expressed appreciation for the US DOS funding of bomb and mine survey and clearance efforts over the years through Project RENEW and Norwegian People’s Aid (NPA), Mines Advisory Group (MAG), and PeaceTrees Vietnam. This significant support from the US government has contributed to a reduction in UXO casualties from an average of 70 per year from 2001 to 2005, to an average of 10 causalties per year from 2010 to 2015, and in the past 18 months threee accidents with one fatality. Mine action programs since the mid-1990s have found and safely destroyed over 600,000 bombs and mines in Quang Tri, and cleaned up neary 29,000 acres of land contaminated with UXO. In addition, these programs have generated 600 stable jobs with decent incomes, contributing to opportunities and improved social conditions in the province. Gov. 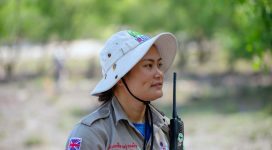 Chinh stated that the goal of these initiatives is to make Quang Tri safe from UXO accidents by 2025. He requested that US DOS funding continue to support mine action programs, especially the comprehensive model that Project RENEW has developed, integrating UXO survey and clearance, risk education and victim assistance under a single management umbrella. He also called for DOS support to establish a Quang Tri Mine Action Center, based on the model of the Legacies of War Coordination Center already established. 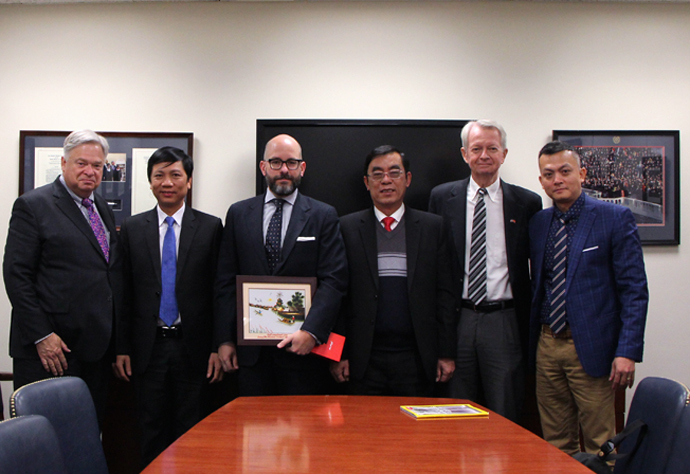 Director Stanley Brown thanked the delegation for the visit to his office and expressed appreciation for the efforts of Quang Tri authorities and residents to deal with explosive remnants of war. He noted the success of mine action programs in Quang Tri Province and linked this success to the role of the Quang Tri government in guiding and facilitating international NGOs’ operations in the province. Holding up Quang Tri Province as an example to be replicated in other provinces of Viet Nam, the US DoS staff urged the province to continue sharing its experiences with national authorities and other provinces so that the problem of UXO can be addressed most effectively throughout Viet Nam. Director Brown said US DOS supports the requests from the Provincial People’s Committee and he committed to continuing to support the objectives laid out in the Provincial Mine Action Program for 2016-2025. US Senator Sheldon Whitehouse’s aid on Defense and Foreign Policy, Mr. Christopher Mewett, pose for a photo with the Vietnamese delegation. Washington DC. 31 October. Photo: Project RENEW. Earlier the same morning, the Quang Tri provincial delegation had a working meeting in the office of US Senator Sheldon Whitehouse regarding assistance to victims of Agent Orange / Dioxin. The Senator’s aide on Defense and Foreign Policy, Mr. Christopher Mewett, hosted the delegation. Responding to Gov. Chinh’s description of the circumstance of AO victims in Viet Nam and in Quang Tri Province, Mewett said that Sen. Whitehouse would work to assure continuing US Congressional support to maintain and increase budgets for remediation of AO contamination in coming years. In addition to cleanup of up AO / dioxin hotspots at the Da Nang Airport and Bien Hoa Airbase, efforts would be made to earmark funds for victim families. Gov. Chinh expressed his thanks, on behalf of local authorities and the people of Quang Tri Province, especially AO / dioxin victim families, for support from the US Congress and the US Government. He offered assurances that such assistance programs would be carried out with results that provide real benefits to the people in need. Reported from Washington, DC by Ngo Xuan Hien of Project RENEW.